Download "IN THE COURT OF APPEALS OF TENNESSEE AT NASHVILLE Assigned on Briefs Oct. 6, 2008"
1 IN THE COURT OF APPEALS OF TENNESSEE AT NASHVILLE Assigned on Briefs Oct. 6, 2008 RICHARD V. FULLER, ET AL. v. JOHN DENNIE CRABTREE, JR., M.D. Appeal from the Circuit Court for Coffee County No. 32,579 L. Craig Johnson, Judge No. 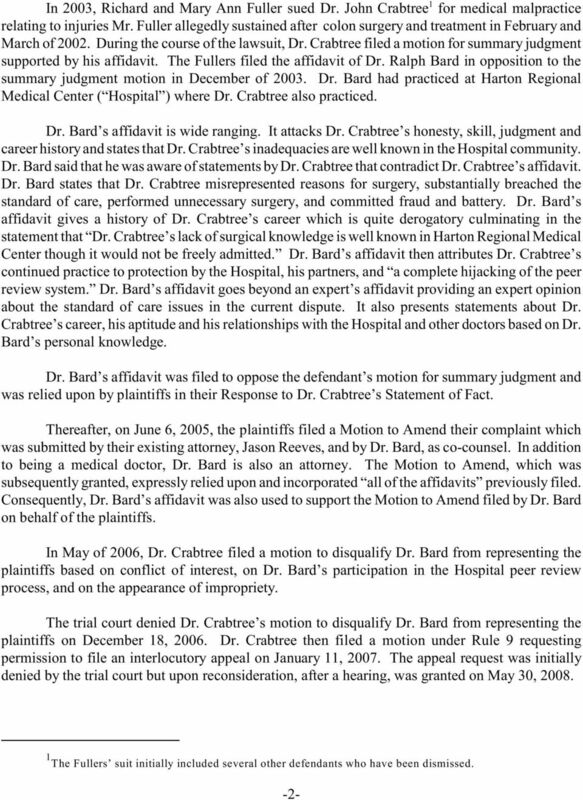 M COA-R9-CV - Filed April 16, 2009 A doctor who earlier submitted an affidavit in this medical malpractice action and who also participated in the peer review process at the defendant doctor s hospital entered an appearance as plaintiffs counsel. 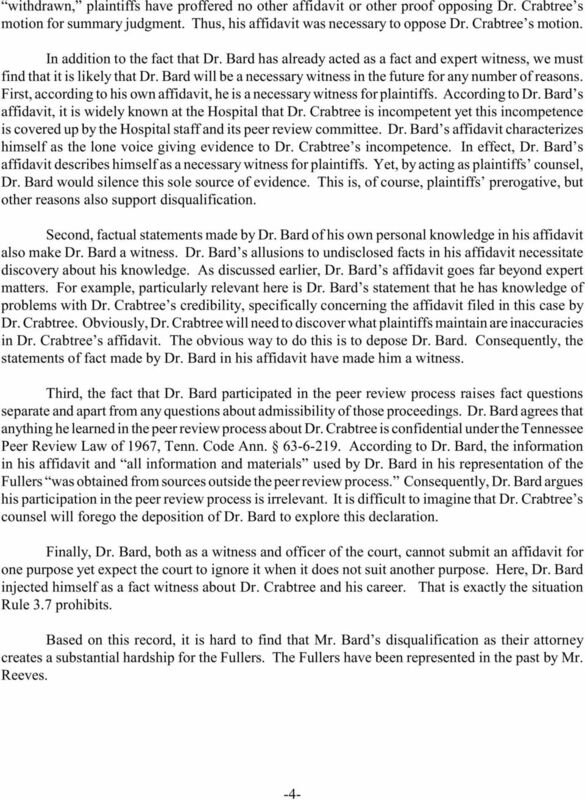 The trial court declined the defendant doctor s request to have the physician/attorney disqualified as plaintiffs counsel. 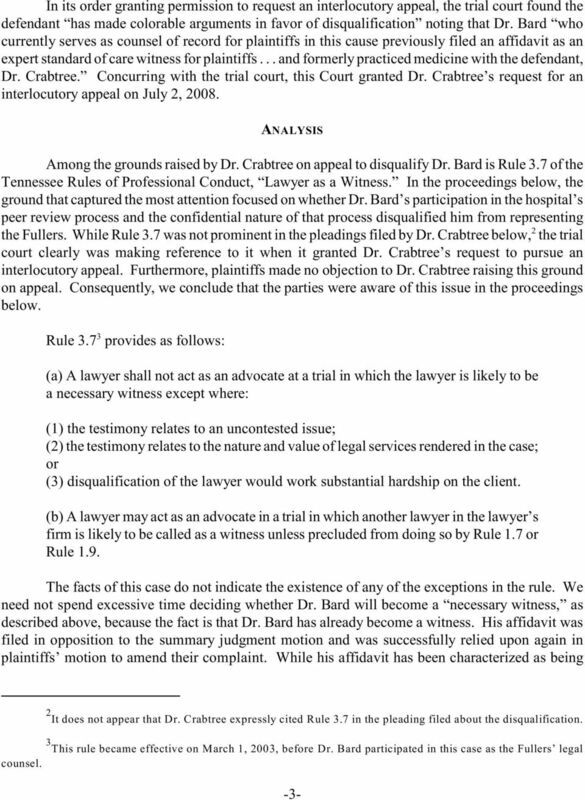 After considering the issue on interlocutory appeal, we reverse and find that the physician/attorney is disqualified and may not represent plaintiffs. Tenn. R. App. 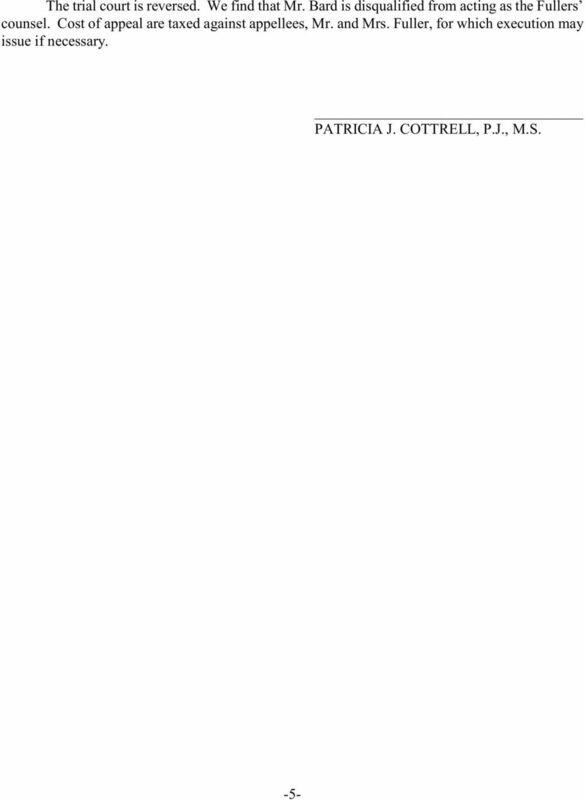 P. 9 Interlocutory Appeal; Judgment of the Circuit Court Reversed PATRICIA J. COTTRELL, P.J.,M.S., delivered the opinion of the court, in which FRANK G. CLEMENT, JR. and ANDY D. BENNETT, JJ., joined. Arthur P. Brock, H. Dean Clements, Carl Eugene Shiles, Jr., Chattanooga, Tennessee, for the appellant, John Dennie Crabtree, Jr., M.D. Ralph M. Bard, Jason Ryan Reeves, Tullahoma, Tennessee, for the appellees, Richard V. Fuller and MaryAnn Fuller. 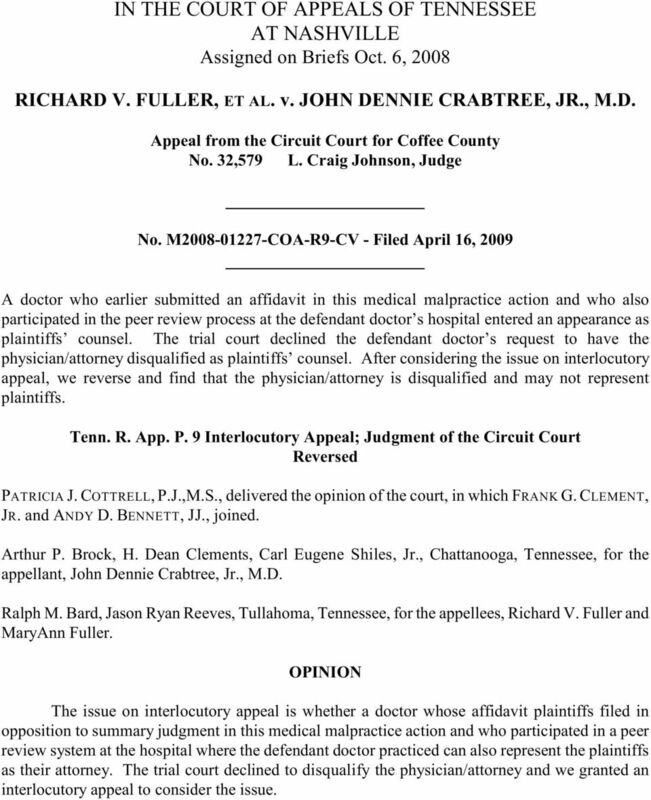 OPINION The issue on interlocutory appeal is whether a doctor whose affidavit plaintiffs filed in opposition to summary judgment in this medical malpractice action and who participated in a peer review system at the hospital where the defendant doctor practiced can also represent the plaintiffs as their attorney. The trial court declined to disqualify the physician/attorney and we granted an interlocutory appeal to consider the issue. IN THE COURT OF APPEALS OF TENNESSEE AT NASHVILLE Assigned on Briefs April 28, 2009 REBECCA METTES v. J. THOMAS JOHN, JR., M.D. Appeal from the Circuit Court for Davidson County No. 06C-3306 Thomas W.
Rizwana Shaikh, Rizwana Shaikh, individually and Shoukat Shaikh. GLEN A. SMITH DARRELL GILL, D.O., ET AL. CASE NO. 1D12-2739. John W. Wesley of Wesley, McGrail & Wesley, Ft. Walton Beach, for Appellants. IN THE COURT OF APPEALS OF MARYLAND. Misc. Docket AG. No. 13. September Term, 2005 ATTORNEY GRIEVANCE COMMISSION OF MARYLAND WILLIAM M.
IN THE COURT OF APPEALS OF MARYLAND Misc. Docket AG No. 13 September Term, 2005 ATTORNEY GRIEVANCE COMMISSION OF MARYLAND v. WILLIAM M. LOGAN Bell, C.J. Raker Wilner Cathell Harrell Battaglia Greene JJ. DELAWARE STATE BAR ASSOCIATION COMMITTEE ON PROFESSIONAL ETHICS OPINION 1991-4 August 21, 1991 THIS OPINION IS MERELY ADVISORY AND IS NOT BINDING ON THE INQUIRING ATTORNEY OR THE COURTS OR ANY OTHER TRIBUNAL.